Thor is an ideal character on which to base an online slot machine; a superhero surrounded by mythology gives the developers lots of scope for imaginative symbols and Cryptologic have done their homework here. Being a Marvel slot, Thor is also connected to Cryptologic’s Marvel’s progressive jackpot network which can you the big bucks. It’s a five reel and nine payline game with every symbol related to the Norse superhero – there are none of the playing card symbols which tend to feature in many slots. The symbols range from rune stones at the lower value end of the scale up to Thor’s enemies at the top end. The Thor symbol is the scatter which triggers the bonus game while Thor himself is the wild symbol which substitutes for all others except the scatter to form winning combos. The backdrop to the game is a Scandinavian scene of a colourful sunset which is reflecting in the purple seas over snowcapped mountains. The bonus game is quite basic but a good one which should prove pretty lucrative; you need to land three or more scatter symbols anywhere on the reels and you will then be awarded ten free spins. During this bonus feature all your wins are tripled but as always, the lines you were playing in the normal game are the active ones in the bonus game. What’s more, it’s possible to re-trigger the bonus game by spinning three more scatter symbols during the free spins so it’s well worth winning. Thor is connected to Cryptologic’s Marvel Hero Jackpot network which allows players the chance to win three different jackpots – the Hero Jackpot, Super Hero Jackpot and Marvel Hero Jackpot. Wins are triggered randomly but the higher your wager the greater your chance of landing the big prize. 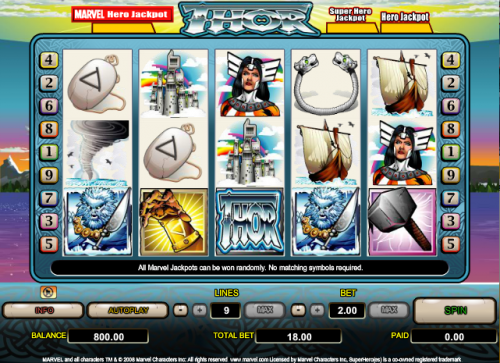 Thor is a simple but entertaining slot with a decent bonus game; low rollers will appreciate the chance to play for as little as £0.01 but there’s a maximum stake of £18.00 per spin which may not be enough for the high rollers.